When you're wearing a swimsuit, a stylish, controlled fit is a must. That's why we engineered the Women's Twisted Bra Tankini Swimsuit using our most advanced and durable fabric - Durafast Elite. 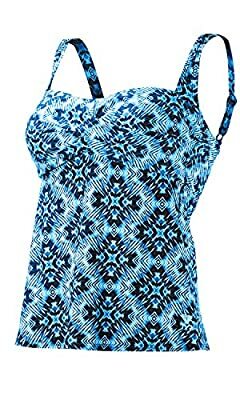 Utilizing high denier poly fiber and innovative circular knit construction, this swimsuit combines the strength and colorfastness of polyester with the comfort of spandex. The TSTV7A fitness suit features a flattering twisted front, thick/adjustable straps and full coverage front and back. It is also equipped with thin, supportive contour cups to maximize your shape and give you a beautiful look without the lines. Chlorine proof and colorfast, these aquatic fitness swimsuits are able to sustain 300+ hours of use, while maintaining a comfortable hold on your body. Choose from an array of vibrant colors and flatter your body in style every time you dive in!